Have you ever been in such a situation that when installing devices on a corporate network, everything goes the way that you want it to except for the power supply. It would be either too cumbersome, or too costly, to have a perfect location for a power outlet. And have you attempted to deploy a wireless access point, only to find the power access cannot reach it. And that’s why Power over Ethernet has emerged for you. It is acknowledged that the advent of Power over Ethernet (PoE) has offered a revolutionary way for IP telephones, wireless LAN Access Points, security network cameras and other IP-based terminals to receive power, in parallel to data, over the existing CAT5/5e/6 Ethernet infrastructure without the need to make any modifications in it. Power over Ethernet is a technology that enables the safe transfer of Direct Current (DC) electrical power along with data over standard network cabling. Both the data and the power may share the same wire, and each is independent and unaffected by the other. 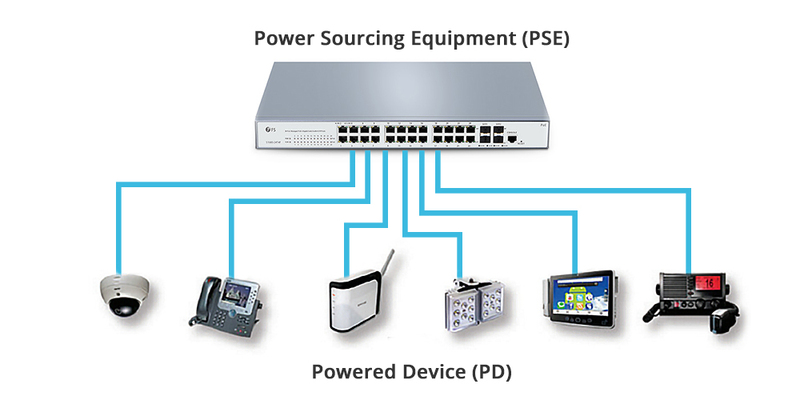 A typical PoE system consists of a Power Sourcing Equipment (PSE) and a Powered Device (PD) or several PDs. According to the IEEE 802.3af specification, PSE is responsible for inserting power onto an Ethernet cable. The PSE may either be an Endspan (PoE switch) or a Midspan (PoE injector). And the PD is a device that draws power from the PSE, which could be an IP phone, a WLAN access point or any other IP device requires power. Cost Savings: No need to install power outlets and no need to hire licensed electricians. Flexibility: Easily move devices to wherever a LAN cable can go and install devices where it is difficult to get power. Simplicity: Install only Ethernet cable to the end device and minimize cable clutter and saves space. Safety: No AC power is needed for outdoor applications and no need to meet electrical building codes. Functionality: End devices can be reset remotely. In 2003 the IEEE ratified the 802.3af PoE standard that allows up to 15.4 Watts of power for each port. Late in 2009, the IEEE ratified the 802.3at PoE Standard known as PoE+. 802.3at is necessary because PD vendors are starting to produce devices that require more power than the 15.4 Watts available with 802.3af. 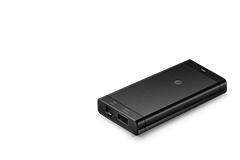 With 802.3at , PDs can be powered with up to 25.5 Watts. 802.3at is backward compatible with 802.3af . If a PSE is "at" and the PD is "af", it will work fine. The PSE recognizes that the PD is "af" and only gives it as much power as it needs. The reverse situation will not work however, if the PSE is only "af" it will not be able to power an "at" PD. The continuing work of the IEEE 802.3bt Task Force is fueled, in large part, by the continued flow of new and higher powered four-pair PoE products and devices. 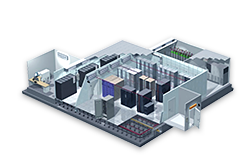 Even without the final and adopted standards, this enhanced technology is already facilitating and enabling more efficient higher power applications in commercial and industrial premises. Once the new standards are adopted, they will improve the interoperability and portability of these new LAN devices. 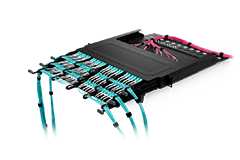 PoE supports four powering options using different combinations of the eight pins on a standard RJ-45 port that connects to four pairs of wire in UTP cabling. In PoE environment, power is carried over the data pairs by using the following four methods. To be IEEE standards compliant, a PD must support both Alternative A and Alternative B, whereas a PSE may support either Alternative A or Alternative B, or both. 10/100BASE-T Alternative A: 10/100BASE-T Alternative A injects the positive DC power on pins 1 and 2 and the negative DC power on pins 3 and 6. 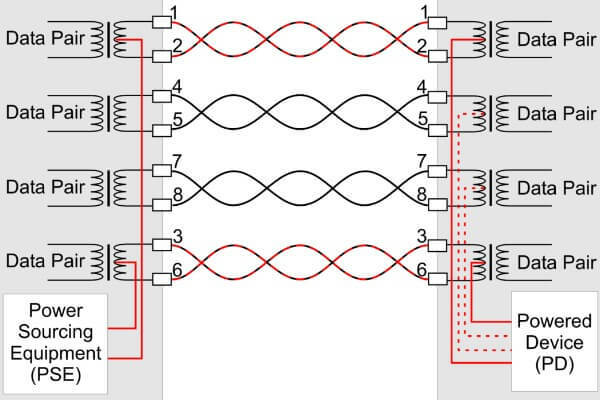 In Fast Ethernet, these are also the data pairs, so the data and power share the same wires . 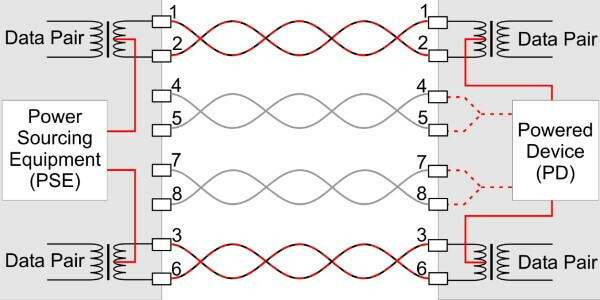 The "sharing" of the wire is accomplished using a technique called Phantom Power, which was originally used as a method for transmitting DC electrical power through microphone cables to operate microphones that contain active electronic circuitry. 10/100BASE-T Alternative B: 10/100BASE-T Alternative B puts the positive DC power on pins 4 and 5 and the negative DC power on pins 7 and 8. In Fast Ethernet, these are the "spare" pairs, so the electrical current is not sharing wires with data, and there is no Phantom Power. 1000BASE-T Alternative A: IEEE 1000BASE-T Alternative A puts the positive DC power on pins 1 and 2 and the negative DC power on pins 3 and 6. In Gigabit Ethernet, all four pairs carry data, so Phantom Power is always required for Gigabit PoE. 1000BASE-T Alternative B: IEEE 1000BASE-T Alternative B puts the positive DC power on pins 4 and 5 and the negative DC power on pins 7 and 8. Generally speaking, there are two ways for you to add PoE to your network, namely with a PoE switch or PoE injector. 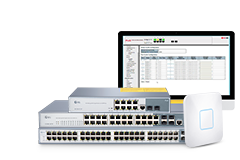 A POE switch is a network switch that has Power over Ethernet injection built-in. Simply connect other network devices to the switch as normal, and the switch will detect whether they are POE-compatible and enable power automatically. 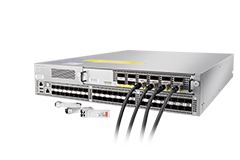 PoE switches are available to suit all applications, from low-cost unmanaged edge switches with a few ports, up to complex multi-port rack-mounted units with sophisticated management. 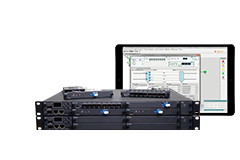 A midspan PoE injector is typically a two-port device that injects power at a point along the UTP cabling. 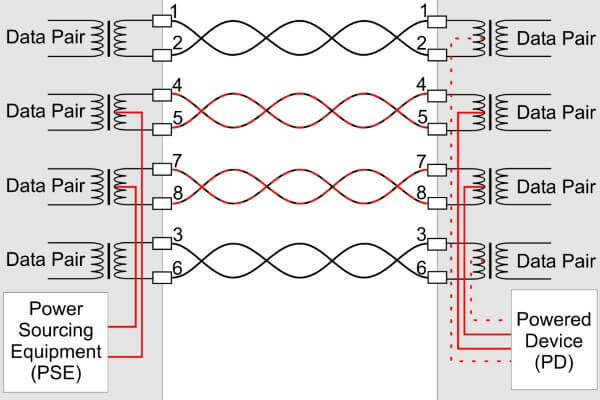 Midspans are used to power PDs that are connected to switches that do not provide PoE. The midspan injects DC power to the cable, and the data passes through the injector transparently. With most midspan injectors, the 100 meters distance limit applies to the entire span, from the switch to PD. 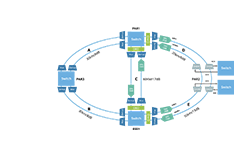 Implementation of a PoE solution involves numerous challenges. First and foremost, the solution must closely comply with communication and safety standards. The PSE is the side responsible for most technological aspects relates to safety. A PSE must not damage existing cabling infrastructure nor non-powered devices connected to it. Therefore, power must only be provided when PoE-enabled terminals are detected and must be terminated quickly after their physical disconnection. And PoE system must be protected from current overloads and short circuits scenarios. PSE's port must be protected from crossed-connection to an adjacent port. Also, thermal protection should be kept to avoid flammability. According to the ANSI/TIA/EIA standard for category 5e (CAT5e) cable, (TIA/EIA 568-5-A) the maximum length for a cable segment is 100 meters (328 ft). PSE power injectors, particularly midspans, do not increase the distance of the data network. A common solution to overcome the distance and bandwidth limitations of copper is to use fiber optic cabling. Since DC power cannot be conducted over fiber, a media converter that functions as a PSE is used to inject power on the RJ-45 port(s). A media converter with PoE converts the fiber to copper, and sends DC power to the PD over the UTP cabling. The introduction of DC power into an Ethernet network may increase noise susceptibility of the system and degrade the Ethernet signal. A PoE solution must not affect data communications, for any RJ-45 connectivity implemented over its cabled infrastructure. It should support 10/100-BaseT Ethernet connections and be upgradeable to support 1000-BaseT. Globally, networks are undergoing a massive transition, coming along with a growing versatility and complexity. Devices once considered to be peripheral, such as wireless access points, security network cameras, and voice-over-IP (VoIP), are now important part of network system. Under this situation, the cabling infrastructure to support and power for devices that are added becomes more difficult. 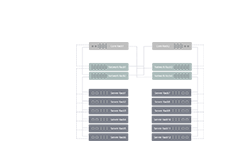 Luckily, now we’ve got Power over Ethernet to fulfill the demand, which has already become a key powering strategy to allow network managers, installers, and integrators to use structured cabling to provide both power and data to many of their network devices.